Rehearsal images of the cast of DOCTOR FAUSTUS have been released ahead of opening night at Duke of York’s Theatre in London’s West End on Saturday 9 April. 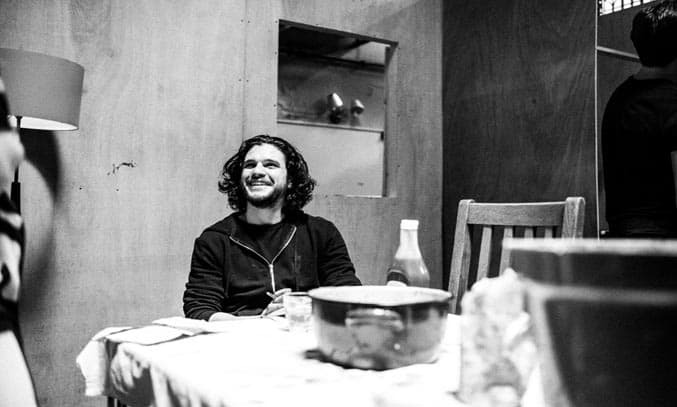 Directed by Jamie Lloyd, the explosive new production stars GAME OF THRONES actor Kit Harington in the title role, alongside Olivier Award-winner Jenna Russell as Mephistopheles, Jade Anouka as Wagner and Forbes Masson as Lucifer. Christopher Marlowe’s legendary tale tells the story of DOCTOR FAUSTUS who sells his soul to the Devil in return for the ability to perform absolutely anything he pleases with the power of black magic. With blackly comic new scenes by Colin Teevan, this 400-year-old play is transported to a celebrity-obsessed society of greed and instant gratification, offering a fresh, new perspective that chimes with our times. Tom Edden in rehearsals for Doctor Faustus. Image Credit: Matt Humphrey. DOCTOR FAUSTUS runs at the Duke of York’s Theatre in London’s West End from Saturday 9 April until Saturday 25 June.